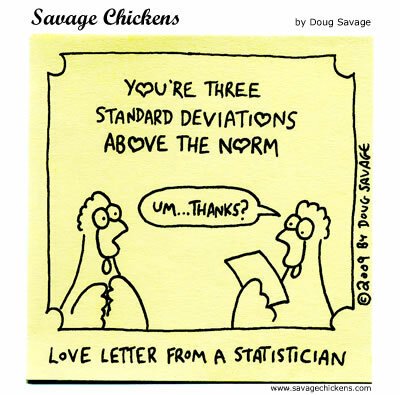 Just for my stats class. I just love this cartoon! 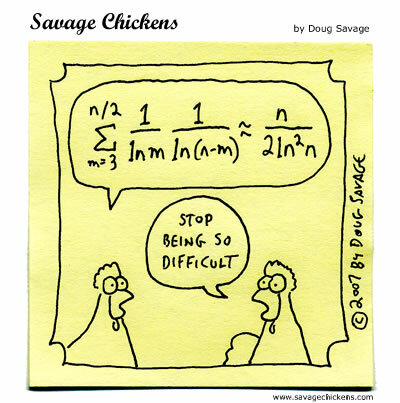 Who knew that chickens on post-its could be so funny? Posted on March 28, 2009 Categories personal updatesTags AP Statistics, comic, savage chickens, statsLeave a comment on Just for my stats class. 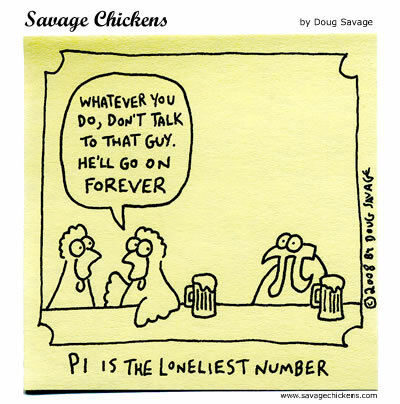 5 days to PI DAY! We are working on projects in Calculus and Statistics leading up to our blowout on Friday. In honor of this very special day for math geeks, I will try to post something interesting every day this week. Today, my Calc students worked on phase 1 of their project. Enjoy your week! Posted on March 9, 2009 Categories personal updatesTags calculus, comic, pi, pi day, savage chickensLeave a comment on The countdown is ON! I have attached some study tips that I found on the net. Good Luck! 1) Recognize that your degree of success depends upon you and you alone. 2) Make an all-out effort to do well in the course. work hard until the very end of the course. you will be successful. You can do it. The attitude with which you approach a course is the single most important factor in determining your success in that course. Begin with a positive attitude and a belief that you can be successful. Mathematics can be learned and understood. We have done our very best to take the mysteries out of mathematics. But for you to reach your goals, you need to make a commitment right now to attend class, to study as we suggest and to give this course your very best effort. With the proper determination, you can master this course. Mathematical knowledge is sequential. New concepts and principles build upon previously learned concepts and principles. The material you learn each day will depend upon material that you should have learned prior to that day. You must do all of your homework BEFORE each class meeting. If you are absent from class you can not begin learning again at the same point as the rest of the class. You must first learn the material that was covered while you were absent. Mathematics is read differently. In reading a novel or a story, a whole chapter may contribute a single idea to the plot of the story, but in mathematics every single word or symbol has a precise meaning and each may contribute one or more ideas. Consequently, you must read slowly and carefully so that you understand the meaning of each word and symbol. Read with pencil and paper available. If you do not understand what the author did in getting from one step to the next, take the time to work it out for yourself. Some things in mathematics must be memorized. Symbols, definitions, rules, and algorithms have to be both memorized and understood. We all forget, so those things which must be memorized also need to be reviewed periodically. We can do this by writing definitions, rules, etc. on 3×5 cards or 8×5 cards and reading them while we wait for a bus or train or between classes at the college or university. However, you cannot memorize everything in a mathematics course. You may be able to memorize enough for one unit exam, but there is always a final exam. Psychologists tell us that we learn best when what we are learning has meaning for us. That is, we can learn more and keep it longer when we understand the material to be learned. The more we review, think about, and see how things fit together, the more meaning these things have for us and the better we understand them and can apply them. In mathematics there is a reason why we do everything that we do and we must know and understand that reason. Mathematics is not learned just by doing problems. It is learned by doing the problems and understanding why we did them the way we did. The “why” of mathematics is as important, if not more important, than the “how” of mathematics. In general, mathematics is to be understood, not memorized. We feel good about what we have done when we know that it is right. We can tell if we are right by checking our answers. Sometimes the answer is in the back of the book, but most of the time we need to perform our own check. The check should be different from and shorter than reworking the exercise. For example, the check for subtraction is addition. 8-5=3, if 3+5=8. Also, the check for division is multiplication. 56 7=8, if 7×8=56. Always check your work! How well you prepare for class determines how much you will get from that class. Organize your day and specify at least one hour a day to study mathematics. It is best to study in concentrated short intervals of approximately thirty minutes with five to ten minute breaks between. The following are some things you should do. 1) Read your class notes as soon after class as possible, preferably the same day. Highlight important formulas, statements, and so on. important. Check the chapter summary. 3) Read the textbook slowly and carefully with pencil and paper available. supplemental study guides that may be purchased in the college bookstore. out. Your instructor may also have additional texts or materials. unsure of and ask your instructor. make an appointment to see him/her in his/her office during office hours. You need to get as much out of your time in class as possible. It is here that you have the benefit of having an expert on the subject at your disposal – your teacher. The following are some things you should do in order to get the most out of class time. 2) Participate in class. Do not just listen to the instructor. Think along with the instructor and anticipate the next step when he/she is doing an example. understand what the teacher has said or why he/she said it. 3) Understand as much as possible before you leave class. room to add additional comments as you review your notes. instructor to explain the first step that you do not understand. available, the math learning center. the class is an excellent idea.Try tape recording the class and use the recording to supplement your notes. Instructor’s permission to record the class. determining how well you do in a course. The following should help. 1) Set your goal high. Try for 100% rather that trying just to pass the test. produces a mental block. So be prepared. study at least an hour a day for the exam. problems that could be contained within each topic. section in turn. Master each section before going to the next. study the examples. If you still can’t do an exercise, ask your instructor. minutes, go to the next exercise. your teacher’s previous tests, tests from the text or from a study guide. The type of test in which you show all work and write the answers is called an open-ended test. The type of test in which you choose the correct answer from those presented is called a multiple choice test. There are many things you can do before and during the test that can improve your score. 1) Arrive early so you will be ready when the test is passed out. 4) Answer the questions in this order. b) Those you are unsure about. ones that you know reminds you of how to do others. come back to it later if you have time. 6) Read the directions to each question carefully. Underline the key words…. asked to find, and any relevant formulas, definitions, or theorems. 8 ) On an open-ended test, show all your work in a neat and organized manner. 9) Check all your answers, time permitting. is no penalty, guess and leave nothing blank. everything or those who know very little. attempt what you know first. Posted on October 2, 2008 Categories personal updatesTags AP Calculus, comic, math, math study tips, savage chickens3 Comments on calculus is tough.